I use a range of mediums and sometimes bounce around in styles for my traditional illustrations. My most common mediums are markers, pencil crayons and water colours (tubes and pencils). I have also begun recently experimenting with gouache paints and a more mixed-media approach. The vast majority of my most recent sketch cards and illustrations are a mixed-media approach with a combination of markers, pencil crayons and acrylic paints. I’m heavily influenced by graphic and comic artwork. Some of my favourite comic artists are Bernie Wrightson, Terry Moore, Michael Allred, Jack Kirby, Stuart Immomen, Frank Miller, Eric Powell, Dave Dorman, and Mike Mignola. Outside of comic artwork, I have always loved Edward Hopper and N.C. Wyeth, which are influences in my full colour illustrations and paintings. I have also loved studying the works of Mucha, Henri Matisse, Goya, and Paul Gauguin. In particular, I love the intricate and organic layouts of Mucha and is something I wish to expand upon more in my portfolio. For the past three years I have contributed artwork to an annual anthology book. 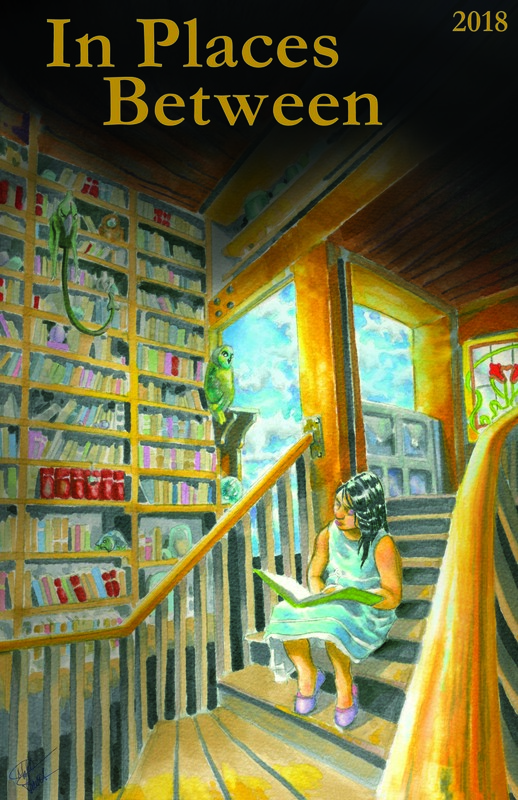 This book, called In Places Between, is produced by the Imaginative Fiction Writers Association (IFWA) and is a fantastic group of local published and aspiring authors. In 2016, I was invited to create a single illustration for the book, which was used as a chapter illustration for one of the book’s short stories, The Pill. The next year I was invited back to do considerable more with collaborating with fellow artist Tara Handelman. Tara created a beautiful blue painting that we used as the design’s background. I created an inked drawing of a man climbing a bone-like ladder and created the graphics, including the lettering. Additional to the cover, I also created five different traditional black and white illustrations. Each illustration represented a different story from the book and like the previous year’s, was used as an illustration to separate each new chapter. In 2018 I was the sole artist for the book cover, a piece that I am very proud of and was very well received by the writer’s group. I have another website that focuses on my web developer skills and experiences, with the occasional posts about that subject. Once you're done checking out this site, why not give the other site a peak?